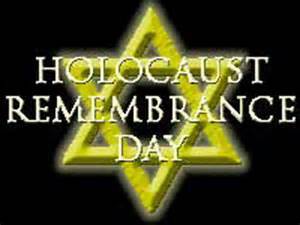 Thanks to my twitter tribble friend Cathy of Colorado @photog357 for reminding me today is the Holocaust Remembrance Day in Israel. JERUSALEM —"Israel dedicated its annual memorial day for the 6 million Jews killed in the Holocaust to mark 70 years to the Warsaw ghetto uprising, a symbol of Jewish resistance against the Nazis in World War II that resonates deeply in Israel to this day. At the opening ceremony at nightfall, President Shimon Peres and Prime Minister Benjamin Netanyahu both linked the desperate Jewish revolt of 1943 to the warrior mentality that enabled the establishment of Israel five years later. "There was a never a rebellion like it. They were so few and their bravery remained as a model for so many," Peres said at Yad Vashem, Israel's official Holocaust memorial, before hundreds of Holocaust survivors and their families, Israeli leaders, diplomats and others." "The annual remembrance is one of the most solemn on Israel's calendar. Restaurants, cafes and places of entertainment shut down, and radio and TV programming were dedicated almost exclusively to documentaries about the Holocaust, interviews with survivors and somber music. The Israeli flag flew at half-staff. This year's commemoration marked 70 years since the Warsaw ghetto uprising, a symbol of Jewish resistance against the Nazis that resonates deeply in Israel to this day." "A wreath laying ceremony at Yad Vashem followed, with Israeli leaders, Holocaust survivors and visiting U.S. Secretary of State John Kerry in attendance." Not just in Israel but all across the United States this week has commemorations to remember those murdered in the Holocaust. "Holocaust Remembrance Day ("Yom Hashoah") is today, and commemorations continue all week, as established by the law that also created the United States Holocaust Memorial Museum, which is celebrating its 20th anniversary. This year's remembrance theme is "Never Again: Heeding the Warning Signs"." May God Bless Israel and all the people of Israel on this remembrance day. Texas mayor ARRESTED for rigging his own election!